The Finnish Border Guard has had the privilege to chair the Arctic Coast Guard Forum (ACGF) for the past two years. However, on Thursday 4 April 2019 it was time to hand over the Chairmanship to the Icelandic Coast Guard, who will lead the activities of the Forum for the following two years. The Finnish Chairmanship concluded in Turku with the Arctic Coast Guard Week, an Arctic super week that consisted of the Polaris 2019 Mass Rescue Operations Exercise, ACGF Principals’ and Experts’ meetings and the first ever Arctic Coast Guard Seminar. After the Polaris 2019 exercise the participating vessel arrived in the Aura River in Turku harbor. Deputy Chief of the Finnish Border Guard, Major General Pasi Kostamovaara and Vice Commandant of the United States Coast Guard, Admiral Charles W. Ray in front of Offshore Patrol Vessel Turva. The Arctic Coast Guard Forum’s Polaris 2019 Exercise took place on 2nd of April in the sea area outside Uusikaupunki, Finland. 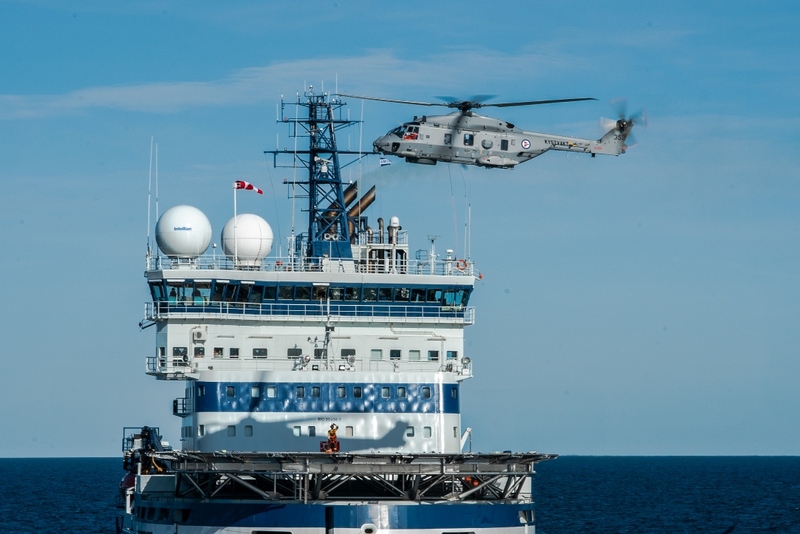 Polaris 2019 was one of the largest international Search and Rescue exercises organized in the Baltic Sea in recent years. Participating assets consisted of six vessels, four SAR helicopters and two fixed-wing aircrafts, from six different Arctic states. All 286 passengers of the exercise were successfully evacuated from life rafts and Arctia’s multipurpose icebreaker Fennica. The exercise also focused on searching for missing persons, ship fire incidents and emergency towing. Large-scale practical exercises such as Polaris 2019 contribute in a concrete way to creating a safer maritime environment both in the Arctic and the Baltic Sea area. Finnish Border Guard’s H215 SAR helicopter refueling on Offshore Patrol Vessel Turva’s helicopter deck during the exercise. Cross-sectoral cooperation between authorities and other actors is crucial when reacting to real life maritime incidents. The part of the cruise ship in distress was played by Arctia’s multipurpose icebreaker Fennica that was left drifting as the result of an explosion taking place in the vessels engine room. Since its establishment in 2015, the activities of the Arctic Coast Guard Forum have developed exceedingly fast. Polaris 2019 was already the second live exercise of the Forum, as the Arctic Guardian was organized in Reykjavik in September 2017. Other activities that have taken place during the Finnish Chairmanship include the Search and Rescue Capabilities survey published in 2017, the execution of a Table Top exercise and Simulator exercise, development of collaboration between Coast Guard authorities and Arctic states Rescue Coordination Centres and expanding activities related to joint international SAR training. The Icelandic Coast Guard will in their capacity as the new Chairman of the Arctic Coast Guard Forum continue the development of the Forum, with a special emphasis on sustainable development and environmental protection. The third live exercise of the ACGF is planned to take place in spring 2021 in Iceland. On 4th April 2019 the Chairmanship of the Arctic Coast Guard Forum was handed to the General Director of the Icelandic Coast Guard, Rear Admiral Georg Lárusson by the Deputy Chief of the Finnish Border Guard, Major General Pasi Kostamovaara. The Arctic super week in Turku concluded with the first ever Arctic Coast Guard Seminar organized on 4–5 April 2019. The seminar consisted of several topical presentations related to Arctic Search and Rescue, Environmental protection measures as well as Research, Innovation and Development issues related to the Arctic maritime domain. Speakers from left to right: moderator André Noël Chaker, Deputy Chief of Operations of Icelandic Coast Guard, Capt. Auðunn Kristinsson, Senior Arctic Official of Finland, René Söderman, Chair of Arctic Economic Council, Tero Vauraste, Commander of West Finland Coast Guard District, Capt. Marko Tuominen, Chair of EPPR Working Group, Arctic Council, Jens Peter Holst-Andersen.